While gaining job experience at your Internship is an important part of your DC experience, exploring DC is also a big factor in making the most of your summer here. Since this past weekend was Memorial Day, there were some special events going on throughout the city. The best way to start any Saturday is with brunch. There are so many fantastic brunch places in The District, but my personal favorite is Matchbox. I order their Crab Cake Benedict every time because it’s THAT good. 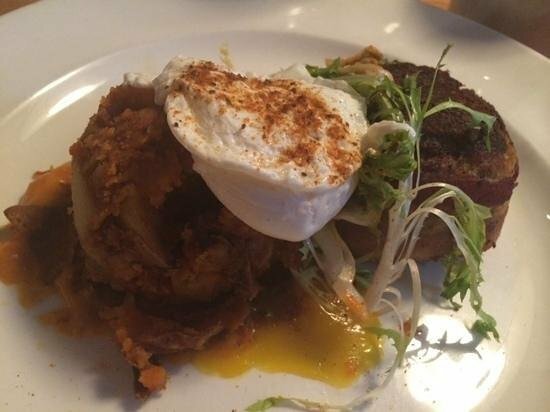 The best news of all: Matchbox has multiple locations and takes Open Table reservations! The rain may have forced us inside the rest of Saturday, but on Sunday morning the sun was shining and we were ready to get to the festivities! We decided to walk to The Lincoln Memorial that way we’d be able to stop at The Vietnam, Korea, and World War ll Memorials on the way to pay our respects to the brave men and women who gave their lives to preserve our freedom. Seeing hundreds of strangers completely silent all honoring our heroes is something I can’t even begin to describe in words. Mentioning of honoring heroes, each year the Rolling Thunder Ride for Freedom is a motorcycle ride from The Pentagon to The National Mall on the day before Memorial Day to honor Veterans, POW/MIA, and those heroes who gave the ultimate sacrifice. The bikers are from all across the country and many are Veterans themselves. Luckily, their route crossed paths with ours. Our next stop was going to be The White House, but the rain returned and we ran inside The Renwick Art Gallery. It’s just one of many Smithsonian art galleries, which are free to the public! An exhibit that really struck my eye was the “Before I Die” wall. So many moving bucket list wishes from people all over the world written on one giant wall. My original wish was to “Visit Ireland”, but after seeing the museum I quickly added, “Visit every DC art gallery”. That evening, The National Memorial Day Concert took place on The Capitol lawn. While I don’t have any fun concert videos (thanks iPhone battery) to share, you’re in luck because the “A Capitol Fourth” concert takes place at the same spot after sunset on July 4th and it’s free to the public! Lastly, my favorite part of the weekend was The National Memorial Day Parade that took place in downtown on Memorial Day. The interesting thing about the parade was that it was essentially a moving timeline of American military history and there were actors who dressed in the uniforms of that time. Mentioning of actors, Criminal Minds star Gary Sinise started his own foundation dedicated to helping veterans and their families. Walking next to his float were families who have benefitted from the foundation. While he wasn’t looking at my camera, I was able to snap a picture of the float. I looked into his foundation afterward and strongly encourage you to do the same! The countdown to July 4th starts now!